Our very own Lauren Fridman explains how 3D printing is used in the STEAM 3D Makerlab. 3D Printing, or additive manufacturing, is the process by which three-dimensional objects are created from digital files. Additive manufacturing is the process of laying down successive layers of material until the object is complete. This process allows for a very stable, lightweight object to be created while limiting excessive use of resources thus lowering production costs. While many commercial 3D printers use a corn-based plastic filament, other materials can be used depending on the application, such as metals, concrete, other plastics, and perhaps one day, human tissue. The global 3D printing market is booming and is expected to exceed $21-billion in revenue by 2020. It has the power to transform almost every major industry currently in existence and will change the way we live, work, and play. Computer-Aided Design (CAD) software is widely available to users for the purpose of 3D modeling. These programs enable users to create digital objects in either the two-dimensional or three-dimensional world. Most CAD tools allow users to create, modify, analyze or optimize digital designs to suit the overall purpose of the object. There are many options for the design software you choose to use, which will depend both on budget and level of ability. Higher-end industrial grade software can cost thousands of dollars annually (per license), but there are also a plethora of free open source tools available to users. The first step for users is to determine their comfort level with these CAD technologies and then find a program that fits their abilities and need. Tinkercad is a free online computer-aided design (CAD) software. It allows users to use simple drag and drop technology to create a 3D print file (.stl) which can then be printed on most 3D printers on the market. 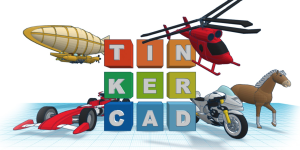 Tinkercad can be utilized for any curricular subject, the only limit is the creativity of the user. Objects are built from a set of mathematical equations. Often based on “real world” project data and parameters. Use feature-based, solid and surface modeling tools to manipulate attributes of the system. Attributes are intertwined so when an adjustment is made, it affects all facets of the design. Uses a database of pre-existing geometric shapes and models. Objects are modified through pushing, pulling, or twisting (Boolean operations). Often much simpler for beginner users of CAD software. 2.4 – Design, build, and test a structure for a specific purpose. 3.2 – Describe structures as supporting frameworks. 3.5 – Identify the materials that make up objects and structures. 3.7 – Describe the properties of materials that enable the objects and structures made from them to perform their intended function. 2.4 – Investigate liquids and solids in terms of their capacity for buoyancy. 2.5 – Design, build, and test a structure that involves interactions between liquids and solids. 3.4 – Describe how each type of simple machine allows humans to move objects with less force than otherwise would be needed. 3.5 – Identify simple machines used in devices that move people. 2.3 – Investigate, through experimentation, the effects of pushing, pulling, and other forces on the shape and stability of simple structures. 2.4 – Design and build a strong and stable structure that serves a purpose. 3.3 – Identify the strength of a structure as its ability to support a load. 3.4 – Identify the stability of a structure as its ability to maintain balance and stay fixed in one spot. 3.6 – Describe ways in which the strength of different materials can be altered. 3.9 – Describe ways in which different forces can affect the shape, balance, or position of a structure. 2.2 – Observe and compare the parts of a variety of plants. 3.1 – Describe the purposes of pulley systems and gear systems. 1.2 – Assess the impacts on society and the environment of light and/or sound energy produced by different technologies, taking different perspectives into account. 3.4 – Describe the characteristics of the three classes of rocks. 2.4 – Design, build, and test a frame structure that will withstand the application of an external force. 3.2 – Demonstrate an understanding of biodiversity as the variety of life on earth, including variety within each species of plant and animal, among species of plants and animals in communities, and among communities and the physical landscapes that support them. 3.1 – Identify the properties of air that make flight possible. 3.2 – Identify common applications of the properties of air, such as its compressibility and insulating qualities. 2.3 – Investigate scientific and technological advances that allow humans to adapt to life in space. 1.1 – Assess the impact of selected technologies on the environment. 3.8 – Describe ways in which human activities and technologies alter balances and interactions in the environment. 2.2 – Design, construct, and use physical models to investigate the effects of various forces on structures. 2.3 – Investigate the factors that determine the ability of a structure to support a load. 2.4 – Determine the most efficient way for a structure to support a given load. 3.3 – Compare the structure and function of plant and animal cells. C2.5 – Construct molecular models to represent simple molecules. C2.2 – Construct molecular models to illustrate the structure of molecules in simple chemical reactions and produce diagrams of them. E1.1 – Evaluate the importance of various technologies, including Canadian contributions, to our understanding of internal body systems. C2.3 – Predict the shapes of simple molecules and ions and give examples using the valence shell electron pair repulsion (VSEPR) model and draw diagrams to represent their molecular shapes. E.g. Inquiry based learning activity in tinkerCAD where students are given the introduction to VSEPR model, which is essentially determining the 3D shape of various simple ions & molecules like CH4 (methane) and bonding angles. Students then create the structure and this is validated afterwards through peer and teacher review. Potential for use in tissue engineering and similar applications. Layers of living cells are deposited into a gel-based medium and slowly built up into a three-dimensional structure. Prior to conducting major surgeries, surgeons can print anatomically correct versions of the patient’s organ. They can take these models and plan their best course of action to ensure best results for patients. Typically would utilize Fused Deposition Modeling (FDM) technology. Involves laying down materials in layers. Allows for rapid prototyping and rapid manufacturing. NASA has been known to use this type of 3D technology. Designers can create digital files from Earth and send them up to the printer at the International Space Station. Printing on demand can revolutionize longer distance journeys in space. Changes the way supplies can be replaced. Could allow for creation of objects that historically could not be launched into space. 3D scanning is a non-contact and non-destructive tool that captures the shape of physical objects using a line of laser light. These scanners allow users to collect an object’s exact dimensions and recreate it in a digital form that can then be manipulated or utilized. Laura Dobos, one of our research assistants, has taken on the challenge of learning our newest piece of tech – our CNC machine (Carvey). Here’s what we think so far! People’s Daily (2015), “China taps 3D printing consumer market”, available at: ht tp://en.people.cn/n/2015/0908/c202936-894 7367.html (9 September 2015). Information for this page provided by Laura Dobos & Brendan Oldman.